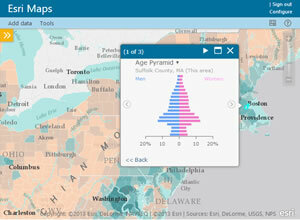 Location Analytics apps let you investigate demographics using thematic maps and infographics. All of Esri's Location Analytics apps are now available at no extra cost with an ArcGIS Online subscription or Portal for ArcGIS. This means that if your organization uses business intelligence (BI) or customer relationship management (CRM) systems, or productivity systems such as Microsoft Office, your organization can now easily tap into the ArcGIS platform from within them. Perform self-service mapping and spatial analysis in just a few clicks. Access an amazing library of map layers from Esri and from other ArcGIS Online users, including Esri's exclusive demographics and lifestyle datasets. Create location-enriched information products, including interactive maps and infographics that can be shared with colleagues for more insightful decision making. You can create areas that can be reached within a specified drive time or drive distance using Location Analytics apps. Esri Maps for Salesforce will be available later this year. To install and configure the apps, you must be an administrator of an ArcGIS Online paid or trial subscription or Portal for ArcGIS named user license. US customers with questions can contact Esri Customer Service or call 1-800-447-9778. Non-US customers can contact their local Esri representative. You will also need administrative access to the business system you're using (e.g., Office, SharePoint, Cognos, MicroStrategy, BusinessObjects, Dynamics CRM). For more information on configuration and system requirements, see Location Analytics. For a listing of additional apps available with ArcGIS Online, visit ArcGIS Marketplace.